Wild Garlic found in our new garden! 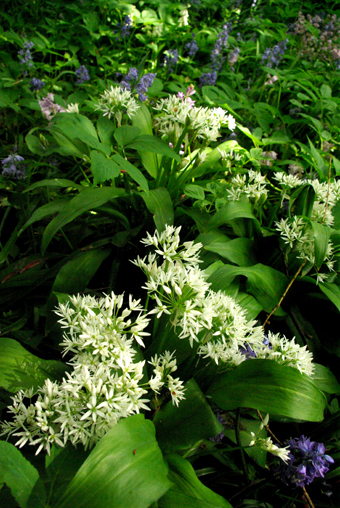 I’m so thrilled that I’ve actually found a big patch of Wild Garlic in our new garden in Hornsea. Just past the sunken garden, surrounded by a mini-forest of bluebells, and looking very healthy. Wild Garlic found in our new garden. Brilliant! I was nurturing a tiny patch of Wild Garlic in our house in Hessle, which I had planted from scratch, so I was very sad at leaving it. But I did plant some bulbs in a wide deep planter last Autumn in the hope it would survive the Winter weather and become my new Wild Garlic patch, but guess what, it didn’t survive. So imagine my yelps of delight when I stumbled across this patch of aromatic garlic with its beautiful tiny star-shaped flower. Erik came running, but I sent him back to the house to retrieve his camera – the great photo above is all his handiwork. You can be sure that the Wild Garlic found in our new garden will be nurtured, encouraged to spread out and we will enjoy using it in many recipes over the next few years, so keep watching.